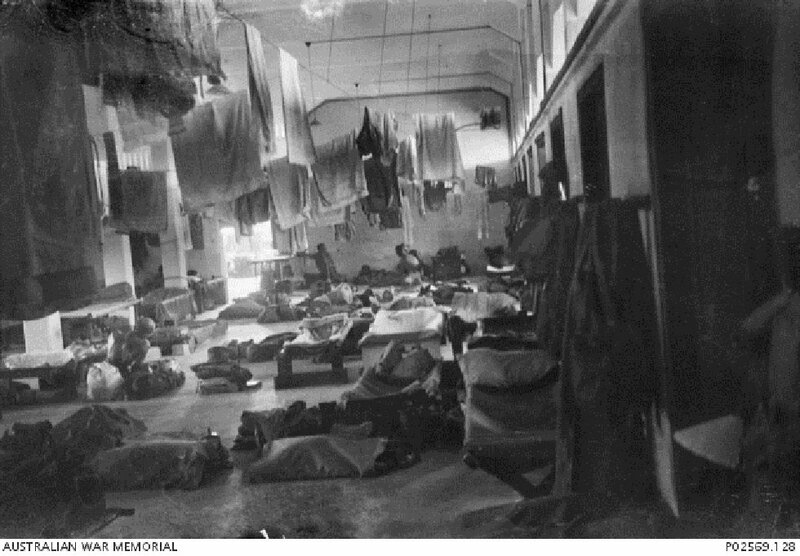 Unidentified POWs rest on their charpoys (makeshift beds of woven coconut husk fibre for mattresses) in their sleeping quarters at Selarang, February 1942-1943. Image courtesy of George Aspinall, Australian War Memorial. The trial concerned 3 different charges against the 4 defendants regarding the the ill-treatment of POWs during various periods of time at the Saigon Prisioner of War Camp No. 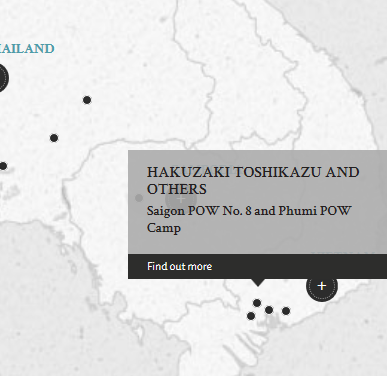 8 and the Phumi Prisoner of War Camp in French Indo-China. All the defendants were the staff of the camps in charge of the POWs. The first charge was levelled against all the defendants. The second charge was against the 1st, 2nd and 3rd defedants. The third charge was against the 4th defendant. The 1st defendant, Captain Hakuzaki Toshikazu was the commandant of Saigon Prisoner of War Camp, the 2nd defendant, Sergeant Major Yoshida Daikichi was in charge of supplies and transport there while the 3rd and 4th defendants, Korean Guard Kanayasu Hochin and Korean Guard Kureshima Kojun were guards. Due to overcrowding, Phumi Prisoner of War Camp was opened and the 2nd defendant was placed in charge of the camp and the 4th defendant was a guard there. Here the ill-treatment alleged by prosecution included insufficient and overcrowded accommodations, insufficient food, harsh labour, regular and severe beatings, "sick parades" where ill patients were lined up and some sent home arbitrarily from the hospital and forced to work, selling patients' medication for money, and stealing items from POWs' parcels. The 1st defendant denied any responsibility, stating that the orders for the ill-treatment of POWs came from his commanding superiors, and when ill-treatment occurred, it was done by his subordinates whom he duly punished. Furthermore, the inadequate staffing of the camp made it difficult for him to directly supervise each subordinate to prevent ill-treatment. The court found him not guilty of all charges. The 2nd, 3rd and 4th defendants were alleged to have physically abused the POWs and they admitted it was due to their offensive attitudes. The court found the 2nd defendant not guilty on the first charge and guilty on the second charge, and the 3rd and 4th defendants guilty of all their charges. Several of the Dutch Prosecution witnesses who were former POWs were based in Singapore during the proceedings. They resided in Wilhelmina Camp, which was near Geylang at Tanjong Katong Road and was one of the Dutch military bases in South East Asia. Hakuzaki, Toshikazu. Captain. Japanese military. From Japan. Not guilty. Yoshida, Daikichi. Sergeant Major. From Japanese military. From Japan. Guilty. 2 years' imprisonment. Sentence confirmed. Kanayasu, Hochin. Korean Guard. From Japanese military. From Korea. Guilty. 5 years' imprisonment. Sentence confirmed. Kureshima, Kojun. Korean Guard. From Japanese military. From Korea. Guilty. 6 years' imprisonment. Sentence confirmed. Sri Vastava, K.K. Major. From British Indian Army. Advocate. Cleyndert, L.D. Lieutenant. From Dutch military. LLB. Nakamura, Takachi. Barrister, Supreme Court of Tokyo. Navin, J. Captain. From British military.